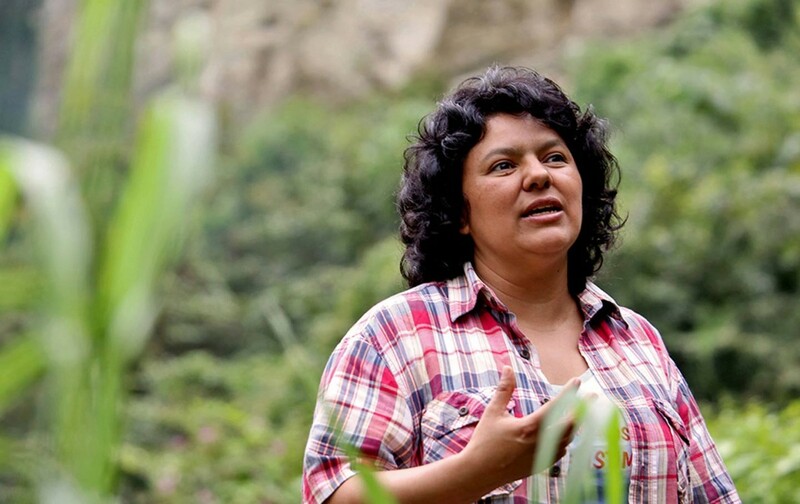 Honduran environmental activist Berta Cáceres was shot and killed in her home in La Esperanza, Intibuca, Wednesday. While the killers’ ID remains unknown, activists, media observers and the Cáceres family pointed to the increasingly reactionary and violent Honduran government, which has frequently clashed with Cáceres over her high-profile activism against land dispossession and mining, and her defense of indigenous rights. There was widespread outcry and grief over her death, and the story was covered by major media in the United States. But there was a glaring problem with the coverage: Almost none of it mentioned that the brutal regime that likely killed Cáceres came to power in a 2009 coup d’etat supported by the United States, under President Barack Obama and then-Secretary of State Hillary Clinton. 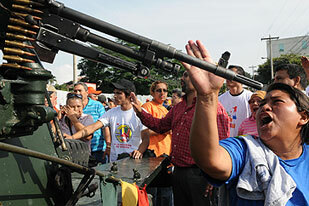 Cáceres was a vocal and brave indigenous leader, an opponent of the 2009 Honduran coup that Hillary Clinton, as secretary of State, made possible. In The Nation, Dana Frank and I covered that coup as it unfolded. Later, as Clinton’s emails were released, others, such as Robert Naiman, Mark Weisbrot and Alex Main, revealed the central role she played in undercutting Manuel Zelaya, the deposed president, and undercutting the opposition movement demanding his restoration. In so doing, Clinton allied with the worst sectors of Honduran society. But Clinton’s State Department staunchly refused to do so, bucking the international community and implicitly recognizing the military takeover. Emails revealed last year by the State Department show that Clinton knew very well there was a military coup, but rejected cries by the international community to condemn it. As The Intercept’s Lee Fang reported, Clinton attempted to use her lobbyist friend Lanny Davis to open up back channels with Roberto Micheletti, the illegitimate interim ruler installed after the coup, effectively endorsing the new right-wing government that would go on to crack down on Cáceres and others activists. On September 28, State Department officials blocked the OAS from adopting a resolution that would have refused to recognize Honduran elections carried out under the dictatorship—giving the US’s final seal of approval to the military coup that began three months prior. One wouldn’t know any of this reading US reports of Cáceres’ death. The coup, and its subsequent purging of environmental, LGBT and indigenous activists, is treated as an entirely local matter, reduced to the “cycle of violence” cliche often employed with destructive governments the United States helped usher into power. 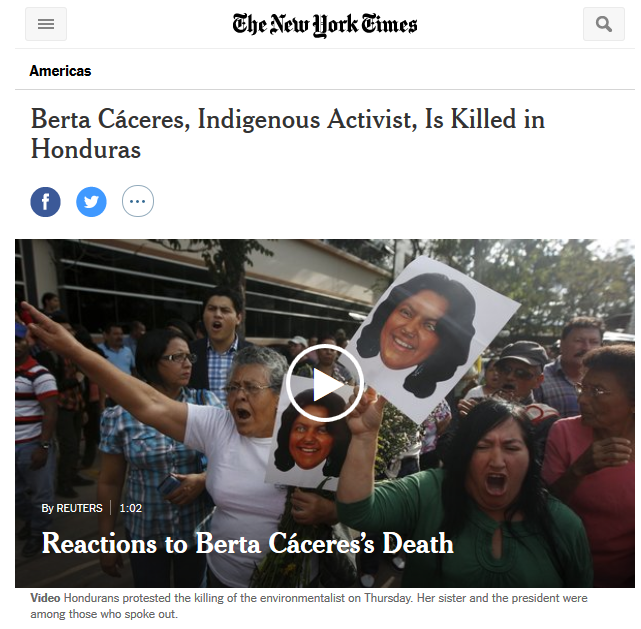 The New York Times mentioned that the Honduran coup put activists like Caceres in danger–but didn’t mention that the US had backed the coup. Since a 2009 coup in Honduras, journalists, judges, labor leaders, human rights defenders and environmental activists have been assassinated in targeted killings, with their murders often going unsolved. Twelve environmental defenders were killed in Honduras in 2014, according to research by Global Witness, which makes it the most dangerous country in the world, relative to its size, for activists protecting forests and rivers. The Times noted how much more oppressive and difficult life is under the new regime, but made no mention of who helped bring that regime about. Cáceres, of course, wasn’t killed in a vacuum. Her death is in part the result of a deliberate strategy by the United States to prop up a regressive, pro-development, pro-corporate government. That US-based media, reporting on the death of a foreign activist, wouldn’t mention their own government’s role is a glaring omission—and one that follows a distinct pattern of global reporting. Chaos in other countries is seen as something organic, a product of failed cultures doomed to perpetual violence. It’s usually more complicated than that—especially in a region with a history of US intervention going back more than a century. The documentation of Washington’s role in the 2009 coup is thorough and unequivocal. Combined with the fact that one of the principal parties responsible for Honduras’ regime change is currently running for president, the international context for the assassination of an environmental activist could hardly be more relevant.